I love a sheet mask. They originate from Korea and boy do the Korean’s lead the way when it comes to Beauty. They are inexpensive, so easy to use and they actually work – they’re like a facial in a packet. The array of masks available on the market is huge. There are wet and dry masks, lip masks, under eye, decolletage and even body masks. Bubble masks have been circulating the internet for a couple of months now and they look hilarious! They bubble up on your face over time and as the bubbles grow, they make you look more monstrous by the minute. 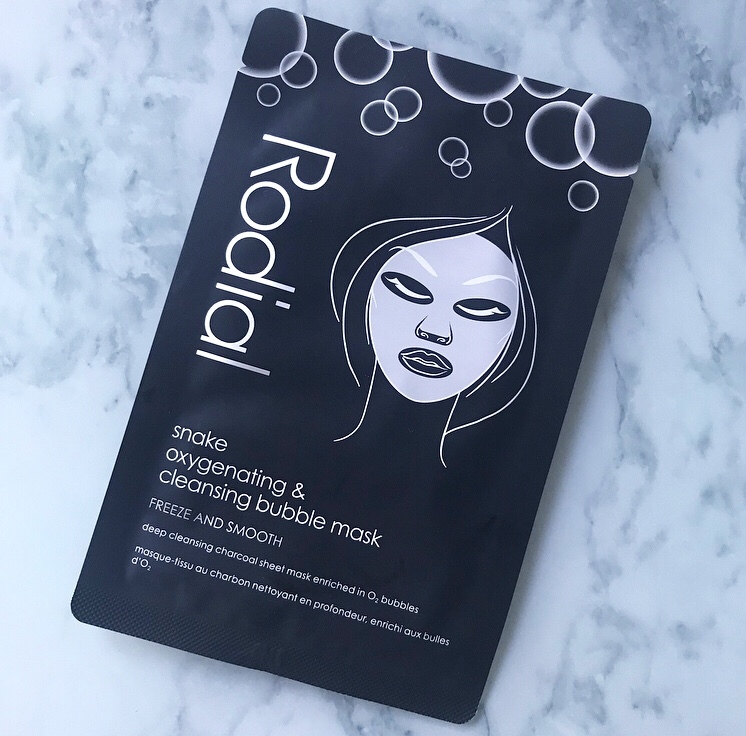 I reviewed the Rodial Pink Diamond Mask a few weeks ago so I jumped to the chance to try the new Snake Oxygenating & Cleansing Bubble Mask which gives skin that extra bit of help which is definitely needed for winter. First of all, what’s amazing about this mask is that it’s £7.50, cheaper than a facial and even cheaper than a cup of coffee and cake! The mask contains all the amazing ingredients to to freeze the appearance of fine lines and wrinkles, plumps and hydrates skin, leaving it looking refreshed a bright. The mask contains detoxifying O2 bubbles to remove dirt…that’s Oxygen directly on the skin to remove dead skin cells and excess oil, revealing a brighter-looking complexion. It also contains Bamboo charcoal to unclog pores and deeply clean skin for fresher and smoother looking skin. The Hyaluronic Acid, plumps and moisturise. Syn®-Ake Dipeptide freezes the appearance of lines and wrinkles and a rich blend of collagen, ceramide, vitamins A & E and peptides leaves it revitalized. I love using this mask, first of all because it’s super fun and funny to use. I had to facetime my sister the first time I used and laughed so much the mask kept slipping off my face. I use it once a month when I really need it – when my skin is looking terrible, before an event, when my skin needs to look alive, but also after a few sleepless nights. It’s definitely a post partying mask so I would highly recommend it this time of year. Don’t be put off by the colour if you have sensitive skin, it’s not scary or full of harsh ingredients to irritate skin. Your skin after, does feel like it’s had a major cleanse so make sure you wash off the residue and moisturise immediately. You skin will look instantly refreshed and awake.